This is deliciously ironic. It’s akin to the Left cannibalizing their own history. 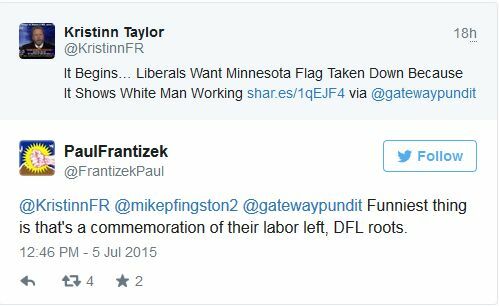 You see, that flag commemorates the Leftist unions – the labor Left – the Minnesota Democratic-Farmer-Labor Party. Yep, Marxists. So, a flag that Progressives contrived as their own for uber Left-leaning Minnesota is not Marxist enough for them evidently. It’s too white. They object to the white man working the field, toiling away to show how strong and independent labor is. More political correctness insanity and in Minnesota, the Leftists may just get their way. Liberal fascism is alive and well in Minnesota. Leftists want the Minnesota flag taken down because it shows white men working on a farm and an Indian with a spear. The Minnesota state flag depicts a white man as a hardworking, rugged individualist, and an Indian riding a horse and holding a spear. The current interest in the removal of the Confederate battle flag from public displays and store shelves provides an excellent opportunity to examine what the Minnesota state flag represents. The images on the flag are interpreted by state documents as innocuous symbols of the state’s history. A critical examination of what the flag is saying, however, should make Minnesotans reconsider what their state flag projects about their state. 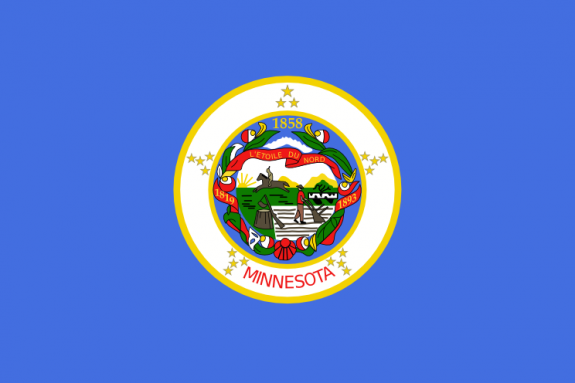 The state flag of Minnesota is often something that is taken for granted. Thousands of people see the flag flying without giving it a second thought. First unfurled in 1893 (a date found on the flag), it has the state seal featured prominently in its center. The seal was based on a painting by Seth Eastman and was promoted by Gov. Henry Sibley; it did engender criticism when first used in 1858, but was not changed. The “great symbolism” of the figures on the seal, as described by the Office of the Minnesota Secretary of State, include an American “Indian on horseback … riding due south and [representing] the Indian heritage of Minnesota. The Indian’s horse and spear and pioneer’s ax, rifle, and plow represent tools that were used for hunting and labor” (Minnesota Legislative Manual). A close examination shows the central figure to be a white pioneer dressed in work clothes, wearing a wide-brim hat and pushing a plow. He is an iconic image of a hardworking, rugged individualist who works alone to chop the trees, plow the land and protect his home. He is looking over his shoulder at the Indian, who is riding a horse and holding a spear. The modern day leftists obviously forgot that the flag was designed to commemorate the state’s labor left party. Maybe we should just amend the flag to show Americans lounging around doing nothing, because with the unemployment rate and entitlements being what they are, that would be far more accurate these days. Throw a little rioting in there and religious persecution and it would be perfect. Minnesota is also a state bringing Islamic refugees in by the plane load, so maybe they should add the Star and Crescent of Islam to their flag and maybe a communist hammer and sickle. That should cover just about all of it. Unless of course you want to also show a bomb going off or gulags being built. That would be a perk, I suppose. Obama and the Progressives are definitely changing and rewriting our history in their image. This would be laughable if it wasn’t so tragic.